Position trading is usually defined as holding your trades for long term trends, such as weekly or monthly. The trades can be held from 1 month to a year or even more. I believe that your trading style is a function of both your psychological preferences and the time you have available for active trading. Some people cannot sleep at night, worrying about their trades, if they know they didn’t close everything. Others lack extreme concentration required to watch the position nonstop from start to finish. With day trading you need to develop a strict market analysis routine during the same hours each day and then watch the price according to your entry system for a couple hours while looking where to place the trades and where to close them. Usually you will want to schedule your trading hours according to main market sessions: Europe and US. Most day traders will close their trade in the end of the trading session if their profit target was not reached yet. With Swing trading, you are mostly interested in daily charts and H4 to confirm the entry point further. The market can be analyzed one or two times a day, trades placed with SL and TP (ideally with 3 position system we discussed in issue 02, and automatic breakeven and trailing stop management). Each day during the same hours you reanalyze the market to see if there are new entry signals or if your current trades should be closed. Position trading, in my opinion, allows to trade while doing analysis only once a week. You are looking for long term investments and any price action signals on H1, H4 or even Daily timeframes can easily distract you from the overall picture on weekly and monthly timeframes. Daily can still be used for price action confirmation along with the weekly trend. Psychologically I prefer swing and position trading styles much more, but it certainly hasn’t been always like that. The allure of “easy” money made inside of just one trading day and desire to go to bed knowing that your net worth is greater than in the morning got me into day trading when I just started. As I mentioned before, it never worked out for me and I switched to trading midterm. It took a good deal of time and effort to change my mindset about trading and stop worrying about positions left overnight. In the end I am much more comfortable with this trading style. Another important aspect to consider when choosing your style is the time you have available (or willing to spend). I do not know about you, but I see very little excitement in watching the market unfold on M1, bar after bar, hour after hour, looking for the entry point – only to continue watching all the same, now looking where to close the trade. Because of the amount of paper work (trading log, trading diary, system improvements diary, pictures with your trading patterns updated daily, etc.) necessary for any trading style, there is considerable amount of time to be invested in it. I consider such journaling to be the most essential step to success in trading business so if I have to choose whether to spend my time watching the trade unfold on M1 or finding more pairs to trade on higher timeframes, while having more time left for journaling, I will not hesitate to choose the later. And yet another part of it, is the amount of rush you have to be in, possibly causing considerable stress as well. I love chess, but I never want a 30 second turn timer to be ticking beside me. Such skill of decision making under stress can be very important in life, but when you have a choice wouldn’t you rather allow yourself enough time to think and consider all options when making important business decisions? Every trade you take is a business decision and if you are willingly forcing yourself to make it under 30 seconds when trading M1 timeframe you might be adding unnecessary stress to your work. All that said, every trader is free to choose any trading style they feel fits them best. However, one important point is that once you’ve chosen your trading timeframe, you’d better stick with it. It is one of the most common trading mistakes to constantly jump from one timeframe to another, hoping to see some signal you might have missed on your main trading timeframe. It is a particularly difficult issue to overcome for me personally so I can share a lot of experience actually making these mistakes again and again. Imagine that day trading is our preferred style and we decided to fade pullbacks along with the higher TF trend. 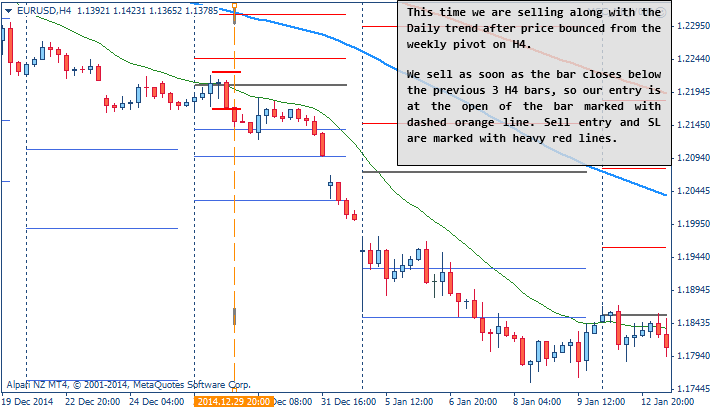 We’ve chosen M5 as our trading timeframe and the goal is to take entries along with the H1 trend. The following charts show exactly the kind of entry we are looking for. Now, let’s say we entered the trade, it went our way and we moved SL into breakeven, as marked on the chart. We are analyzing the market in general and see that trend on Daily is really strong: the price just closed below the lowest of the previous 3 days and it seems that it will go on forever. 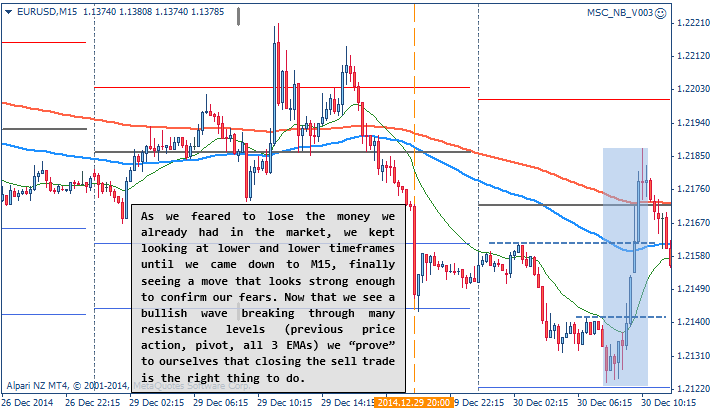 We entered with 0.5% risk and SL was just 8 pips. 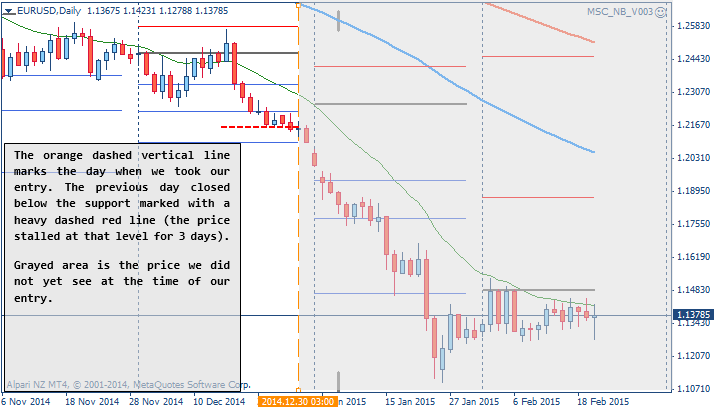 At the lower prices shown on the chart we already had 20 pips profit, resulting in 1.25% paper profits. Now we project the daily trend further into the future and start thinking about holding the trade along with it: with the average range of daily candle in this trend being ~70 pips we make more than 4% every day while the trend continues! That’s a nice profit, and we don’t have to do anything to get it. Right now we have 1.25% in the market already, but it does not seem that much anymore. We decide to ride along with the daily trend. Right at the moment of that decision not only have we broken the system rules (Daily timeframe is not even mentioned in our strategy) but we are also inconsistent in our analysis and in expectations. The next picture shows that the trade is stopped out in breakeven, but the Daily trend is far from reversed – it continues down for hundreds pips more. That’s a really frustrating moment in our trading: not only we gave up 1.5% profit already in the market, but also missed a move that seemed so obvious AND we were actually right about that move. How did it happen? One thing we failed to realize is that the whole move we were trading on M5 is nothing but noise on Daily. If we want to ride the Daily trend, the SL should be positioned in such a way that when it is triggered, your original premise is canceled and has to be reviewed. In this case a proper SL would have been at least above the previous day’s high – 70 pips away compared to our 7. As we can see on the charts the market could have hit our 7 pips SL day after day as we would keep on trying to enter using M5 timeframe, and the Daily trend would still remain intact. The original premise was to take H1 trend, according to our system rules. We already took a good portion of it and because the trade seemed to be without risk (SL at breakeven) we decided to ride the Daily trend as well. But inside of that Daily trend there are countless bullish and bearish H1 trends starting and ending every single day. The market can easily reverse against our position, taking out the SL while not affecting the integrity of the Daily trend in the slightest. Driven by greed, we broke our strategy rules trying to hold for the move that was never planned. In the end we failed to take the trend that was properly analyzed, executed and already in profit – it only remained to take the money according to our rules. I started with a very common example, a mistake I am guilty of making countless times when I was just starting trading intraday. However, there is a reverse situation that I would like to review as well. This time let’s use a higher TF perspective. Let’s say our rules are very similar to that of the previous example. We want to take our entries on pullbacks along with the higher TF trend. The only difference this time is that our trading TF is H4 and we are aiming to take the Daily trend. The following picture shows our hypothetical entry where we fade the pullback, expecting the price to bounce from resistance. 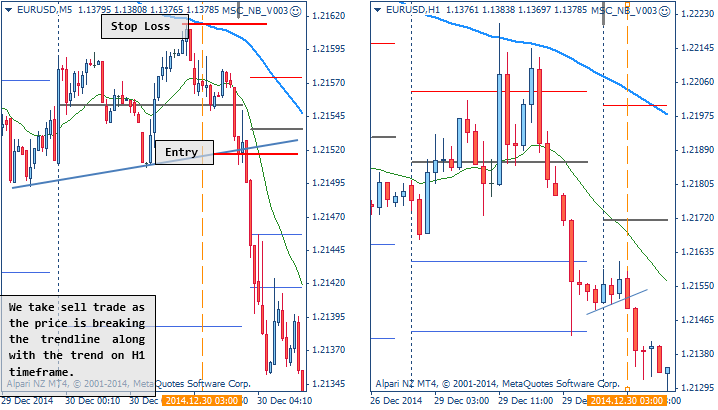 For simplicity, we use the same EURUSD pair, selling it on almost the same day, but this time with different goals in mind. The entry worked out just fine, we have a protective stop order just above the Weekly pivot (marked on the chart) and now we get ready for a long ride, possibly 500-800 pips. One psychological problem with longer term trading is that it is certainly not as “exciting” as intraday. Even on a relatively low timeframe, such as H4, you get no more than 6 candles a day – no matter how hard you try, there is not much to analyze the whole day. Swing traders rightly consider it to be a great benefit, freeing the trader from staring at the screen nonstop and allowing sufficient time to make proper trading decisions. But there is also another side to this, a problem I experienced firsthand so many times. When your trading is going for days, even weeks, your brain really wants to “explore the market”, make sure nothing is wrong with the trade, that the market does not reverse against you and does not take your paper profits away. Given the lack of market information on your trading timeframes (6 candles a day on H4, 1 on Daily) such “exploration” is often done on lower timeframes that are really not part of your system. There were times when I saw the price come to some level of support and bounce from it a couple pips – hardly visible on H4. Losing control of my brain and lacking proper discipline (in the beginning lacking proper strategy definition even) I would start looking for confirmation on H1 that the market is not reversing. Seeing that the bounce certainly looks bigger on H1, but still clearly not predominantly bullish, I would very soon find myself starring at a powerful bullish move on M15, breaking through all the levels of resistance and leaving no chances for the bears to counterattack. Closing my short entry then seemed only logical, common sense – the market is clearly reversing against me. You know the rest of the story – after I took my position out it didn’t took much effort at all for Daily bears to push lower through that insignificant support (especially given the fact that M15 bulls were taking their 50 pip profits (i.e. selling their buys) by the end of the day). Let’s take a look at the next chart, picturing the exact same scenario with our hypothetical EU sell entry. After we defined the problem of being inconsistent in our approach and analysis, it still remains necessary to find a way of dealing with this issue. We will go into this subject in more detail when we start discussing building and refinement of different strategy elements. Today, however, let’s start with a general outline to get us thinking in the right direction. Do I prefer to watch the market on lower timeframes to find the entry and monitor through it to the exit point? Am I susceptible of jumping the gun, closing prematurely, making some technical mistake (buy instead of sell, wrong SL or TP, etc.) if I watch the market nonstop and have to make a trading decisions in a matter of minutes? Do I possess the level of concentration required to watch the market unfold, candle after candle, possibly for a couple hours? Can I imagine myself concerned about my position if I leave it over the night? What about leaving it over the weekend? Over the holidays, such as Christmas or New Year’s Eve? Am I likely to be tempted checking on my trades every couple hours if I leave them long term? There might be some concern about the positions left overnight, but it is something I can deal with and eliminate completely with experience. I am hesitant, however, leaving my positions over the weekend, since the market can gap greatly against me. The same goes for the holidays. Checking my positions 2-3 times a day should be sufficient. Given this definition, would it be helpful for his trading to go to M5 to look for a more precise entry? Similarly, would it be helpful to try and leave his positions along with the Weekly or Monthly trend (that he is not watching nor analyzing)? Because he is not able to watch the price action nonstop, during the whole trading session, M5 is not likely to help him find better entry, as he can be easily stopped out and left without a position. His goal is to see a breakout pattern on H1, put his SL and let the market unfold. At the same time, if he leaves the position along with the weekly trend after he set it in breakeven, he might easily find himself stopped out once again without the weekly trend being canceled. The distance of 100 points to his stop loss is nothing but a small correction on Weekly timeframe. No matter how hard we try it is simply not possible to take every single move on the market. We cannot expect to take a bearish Weekly trend, while fading it on Daily, trying to catch every correction up, and also scalp up and down inside of each trading session. As was already mentioned in previous issues, trader’s expectations can be his worst enemy. When you start on the market with the premise of taking each move, never accepting a loss, finding the best price to enter in the market or any other common trader’s dreams, you are preparing yourself for a disaster. If your expectations are clearly unrealistic and you are not willing to accept that, each time the market proves you wrong will generate a lot of frustration and will fuel the desire to “get even” with the market. At the end of the day it all comes down to our mindset and the amount of control we have over our brain – our desires, fears and expectations.